A simple sausage and pasta dish, made fresher with a bag of baby spinach and a little fresh basil, fun shaped pasta, a couple scrapes of fresh nutmeg and a great handful of freshly grated cheese. Twenty minutes go by and the world looks better. It’s been a helluva week. We just got back from a week long fishing trip. Great fun, great food, horrible bugs. And as lovely as it is to get away, it’s even better to come home. But in addition to the usual unpacking and laundry stuff, fate had thrown a few extras our way. My petunias were dying. Some critter trampled trough the freshly planted vegetable garden (and apparently hastily eschewed the onions,) the barn bridge is starting to collapse, begging for repair, the nine acres of yard needs to be mowed (and the lawn tractor has become testy) and it’s time to make hay. So making this go-to meal, as simple as it is, as warm as it is outside, was still just what I needed to assure me that all's right with the world. Oh, did I mention that my computer is on the fritz? That’s what really has me bummed because how am I going to blog about all the ways we cooked our walleye? How am I going to share with you the absolutely delightful dinner my sister hosted this past weekend? How am I going to share all the new things I’m going to do with my blog, my reading list, my description of my family, my favorite cookbooks? It will all just have to wait a bit. In the meantime, I cooked up this favorite dish and relaxed a bit. A glass of wine helps a lot, too. Tomorrow's another day and I'll be ready to tackle the world -- and plant my begonias. 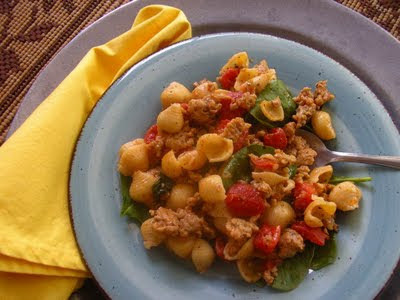 Get the pasta going and while it's cooking, crumble and brown the sausage in a big skillet. When it's browned, add the undrained can of tomatoes. Add the Italian seasoning -- or a mixture of dried basil, oregano and thyme. Drain the pasta and add it to the pan. Add the spinach and stir until just wilted. Add the nutmeg. Add the cheese. Mange. The pasta looks satisfying and delectable! I love that you added the spinach in it. This looks delicious! Hope it fortified you to replant the petunias and smooth out the garden!! Sausage?....count me in! Can't wait to catch up soon. Will be in touch about coming up for a visit. Love ya! Hi Rosemary...we all need meals like this. Meals that we can turn to when life starts to get hard. Thank you for sharing such a fresh and flavorful recipe. I hope you are having a beautiful week. Much love from Austin! I just had my favorite go to meal of french toast and over medium eggs (for dinner!) but can always use ideas for when I'm not in a breakfast food kind of mood! It looks delicious! Looks like a great go-to dish. I need a fork - or spoon- for comfort food, too. The bugs are terrible this year! Her recipes are wonderful, I love to eat pasta. I really enjoyed meeting his blog, and invite you to know my food blog Brazil. In the blog has the option to translate into English. Oh, yum! 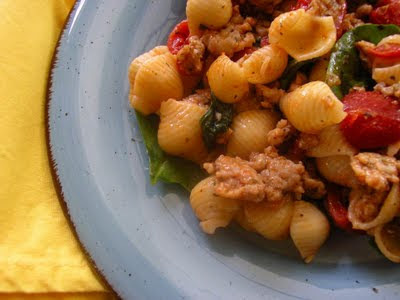 Sausage gives such fabulous flavor to pasta dishes...and this one looks amazing! I love little pasta shells and all the veggies make this a deliciously healthy meal!